I’ve been working with Google Analytics for years. It’s my absolute favorite product for measuring metrics, and I use it every single day to measure success, find trends, and sometimes just answer a client’s questions. 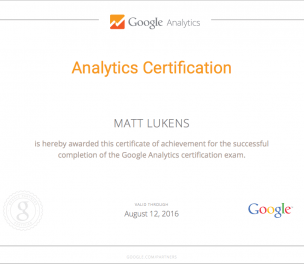 While browsing my google partner profile area, it dawned on me that I’ve never actually gotten certified in analytics?! Contact me today, and I’ll help you get started! What Does Your Traffic Mix Look Like? I consent to 322 Marketing collecting my details through this form.